Come with family or friends, in a friendly and bright chalet, located in the valley of Campan, 15 minutes from the largest ski area of the Pyrenees: the Domaine du Tourmalet (La Mongie / Barrège, more than 100 km of slopes and free ride tracks of the Pic du Midi) with free parking and shuttles available. At 1000 m above sea level, the chalet enjoys superb unobstructed views of the mountains. For lovers of cross-country skiing and snowshoeing, the site of Lake Payole, at the foot of the Aspin Pass, is also 15 minutes. For those seeking relaxation and fitness, the thermal spa of Aquensis and the great thermal baths of Bagneres de Bigorre will make your happiness. Walkers or horseback walkers will be able to go to the site of the lake of Payolle which is at 10 minutes of the chalet. For cyclists, you can climb the legendary Col du Tourmalet and Col d'Aspin. You will also find tennis courts, an 18-hole golf course, a swimming pool, climbing routes, via ferrata. White water sports are also well developed. 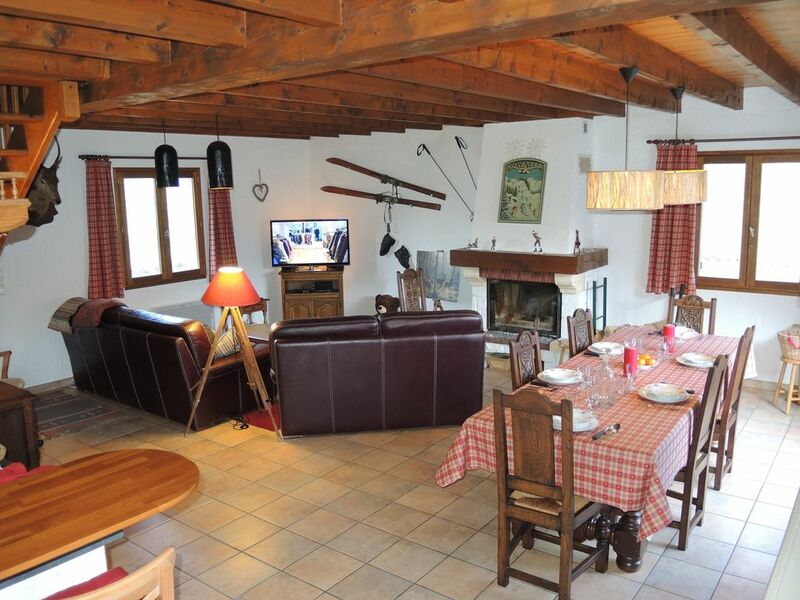 This spacious chalet (120 m2) has a large living room of 50 m2 including a living room with fireplace, (flat screen TV, micro channel), a dining room and a fully equipped kitchen (oven, induction hob, fridge , freezer, dishwasher, washing machine, microwave, 2 raclette machines, coffee machines ...). On the floor you expect 4 spacious bedrooms (2 with double beds and 2 with 2 single beds) with a bathroom with a shower and a toilet. You will find a second bathroom (shower + WC) on the ground floor. A local is also at your disposal to allow you to store your various equipment (skiing, bicycles, hiking, ...).